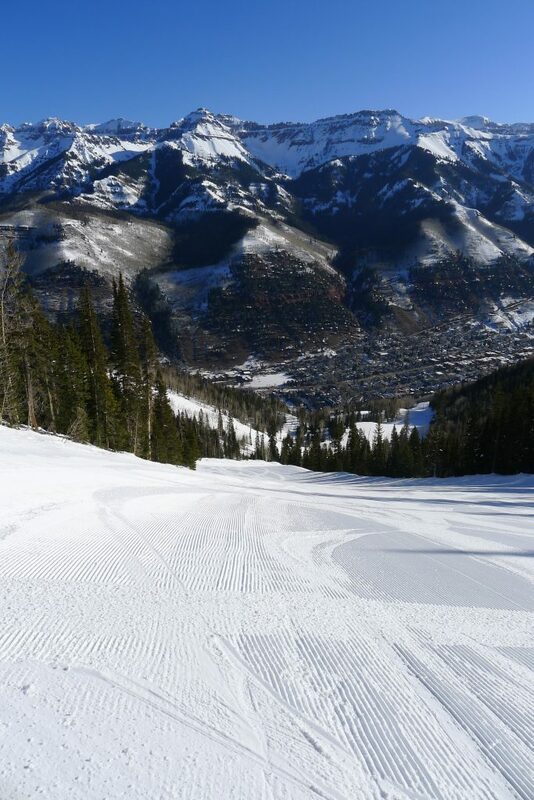 Here it is — our favorite resort is Telluride! 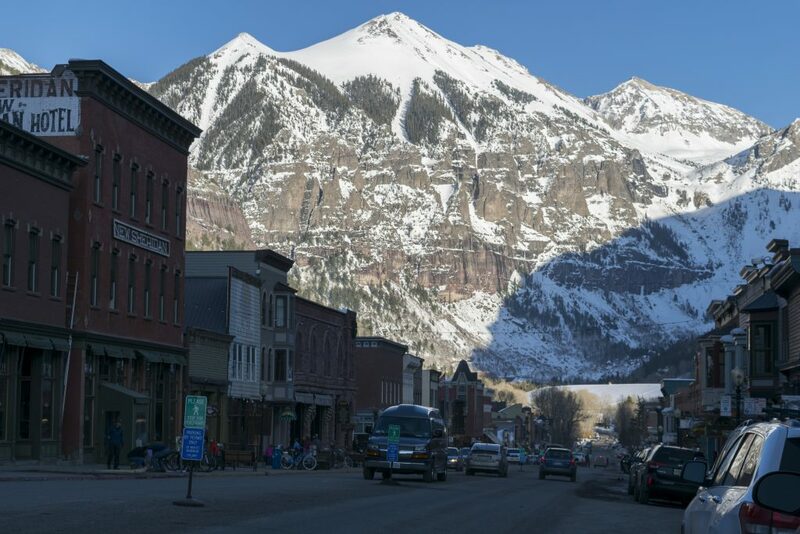 Located in southwestern Colorado far from any large cities and airports, Telluride is an incredible combination of terrain, scenery, and ski culture that attracts people from around the world. 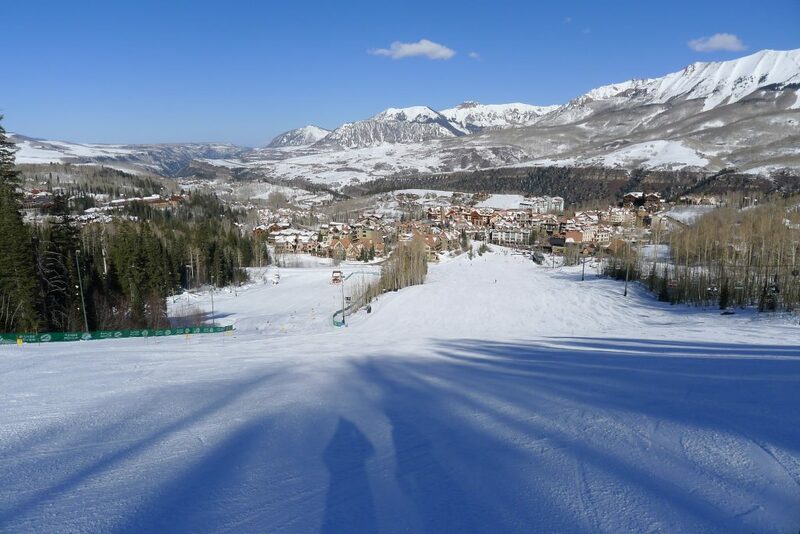 Telluride was the main destination on a ski trip we took in March 2015, but my family started skiing there shortly after it first opened back in the 70’s, so I have watched the place grow from a funky little resort to the world-class resort it is now. 14/15 was a fairly good season for snow, and the resort had received multiple feet of snow about a week before our trip, but unfortunately we missed out on any fresh powder while we were there this last time. When you ski at Telluride you pretty much have to stay locally because the nearest other large town is Montrose and that’s a long drive. You will stay in the “Village” which is up on the bench above town connected via a free gondola which runs until late at night, or you will stay in the main town down in the valley floor. There are lifts and runs starting from either point, so there is no real bottleneck getting started in the morning. We were staying in the town close to the gondola base. There is a large variety of restaurants and bars in both the Town and Village, but the better nightlife is in Town on Main Street. 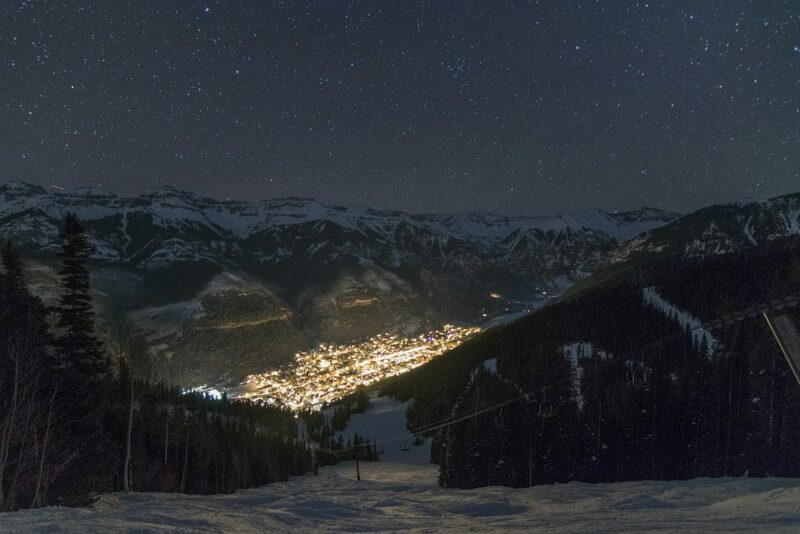 I took the free gondola up at night to take some night shots of the town and mountains which was super memorable. 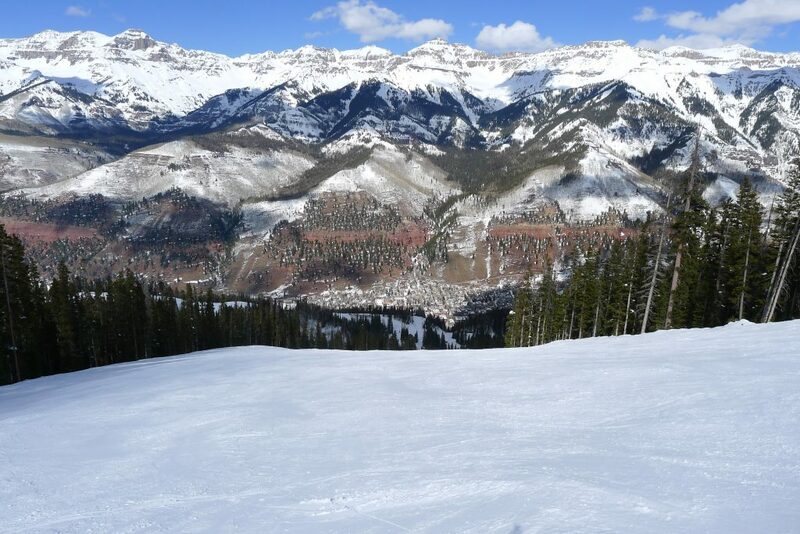 Back in the 70’s and 80’s before grooming technology improved to what it is today, Telluride was known mostly for endless bump runs. All of the runs on the lower front-side that come down into the town were bumpy and seldom skied because they were too steep to be groomed. Now that is no longer the case and many of the steep runs on the front side have snowmaking and grooming. Coonskin was one of our favorite runs on the mountain and we did multiple laps on that one first thing in the morning off the gondola. This is a great place to go when it gets crowded on the rest of the mountain because most people head straight up to the village and don’t bother skiing those runs. 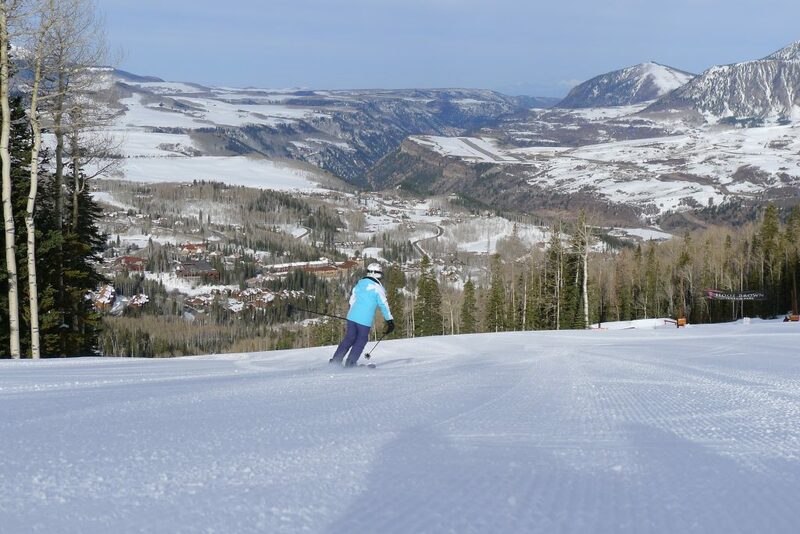 Most of the ski terrain is on the Village side, and most people ski the 3 major intermediate lifts there: Polar Queen express, Village express, and Prospect Bowl express. Prospect Bowl is the best lift out of the 3 for steeper intermediate terrain. 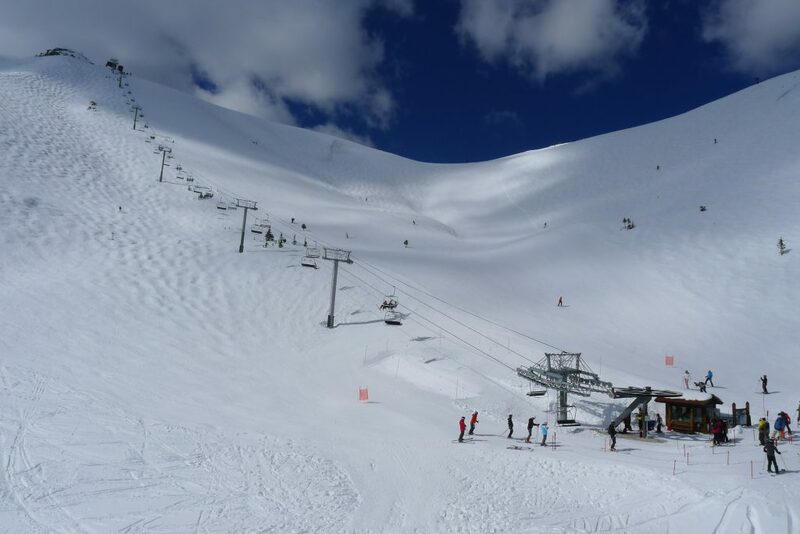 These lifts and runs aren’t anything super special compared to other major resorts though, and this points out one of the problems which is that the terrain is pretty much either steep or flat for the most part. 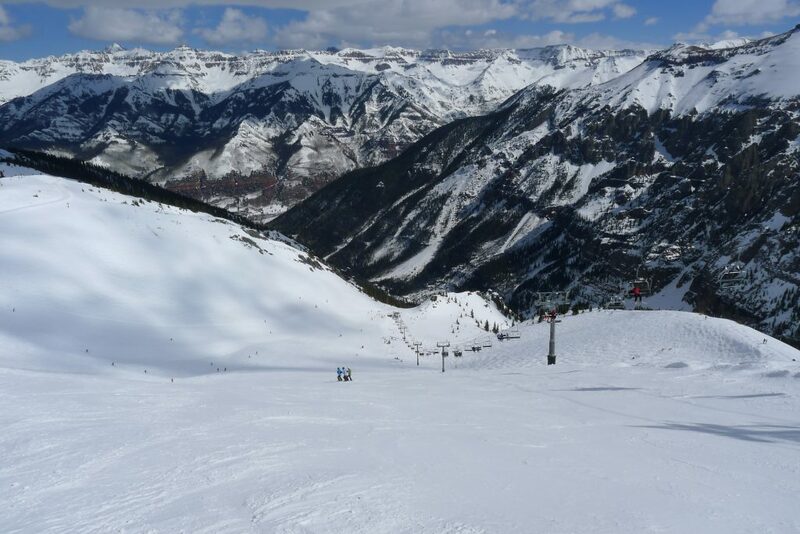 If you are an intermediate skier, there are lots of other resorts in Colorado that would suit you better like Copper Mountain or Vail. Sunshine Express and the Chondola should be avoided unless you just want to point them and have a leisurely glide down beginner terrain. Sunshine has intermediate runs, but they are not really intermediate level. For beginners this would be paradise though, and these 2 lifts provide a lot more beginner terrain than the average large resort does. The main event for us is the rest of the lifts and terrain. The upper mountain lifts all have at least one steep groomer except Gold Hill Express which serves only double-black terrain. Everything off that lift is steep and wind-blown, but you might find some good snow that has been wind-deposited in the chutes. The exposed parts were all blown free of snow so it’s curious to me why they decided to put a high-speed quad in there because it looks like there are really only a couple of skiable lines for the average advanced skier under normal snow conditions. Farther to lookers-right it gets super steep and even in March you would have to pick your way down very carefully if you wanted to ski it. 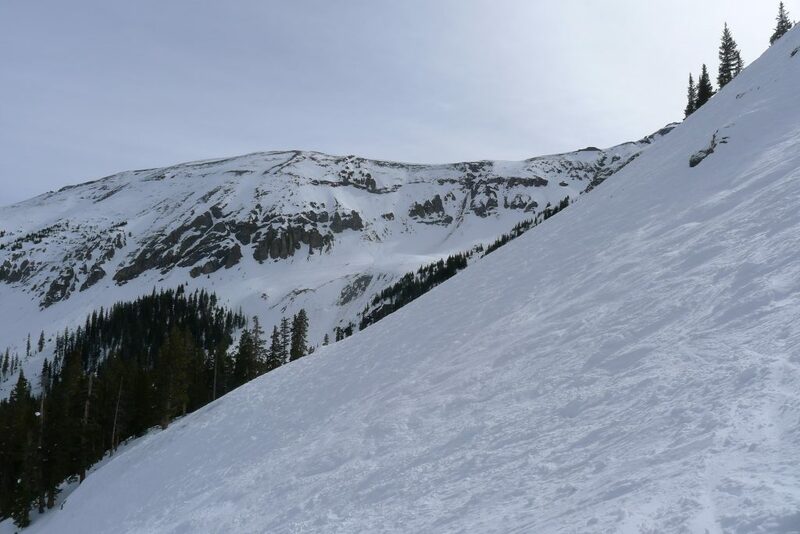 Brave experts can hike all the way up to Palmyra Peak at 13,320′ to ski the chutes up there, but that’s above our level of tolerance for steep exposed terrain. Apex has some double-blue steep groomers on it which is interesting to me because back in the 80’s every run in that pod was rated black. Again, the snowmaking and grooming has improved and they probably regraded some of it to be skiable by intermediates. These were fun, but there is better stuff up on Revelation. Revelation was the most recent addition to the resort, and it tops out at the highest lift-served spot on the mountain which is an impressive 12,570′. This is a steep partially groomed bowl and we saw several people that shouldn’t have been up there going for a long “slide for life”. There is great quality deep snow that is more sheltered from the wind up there. They probably should have made that a high speed quad because it’s very popular terrain. 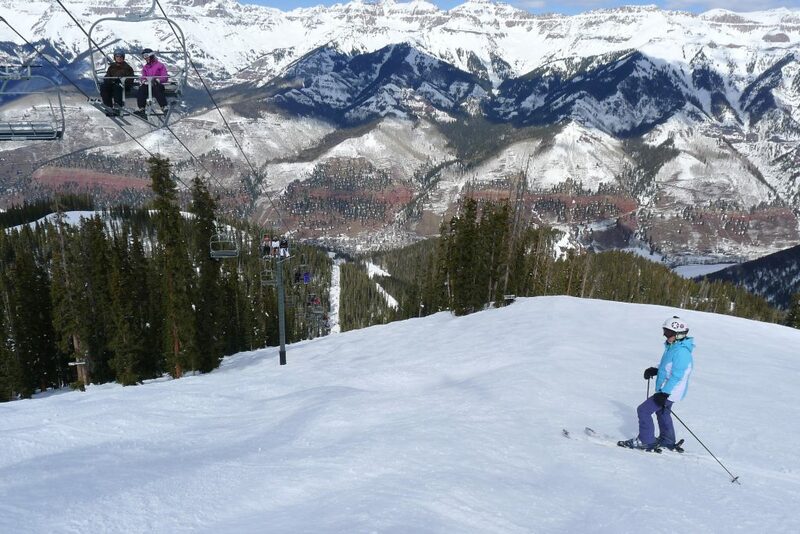 The best lift of any resort on our list is the Plunge lift at Telluride. This is a long fixed-grip triple that takes forever, but it serves the 3 best steep groomers we have ever skied. Our favorite was Bushwacker. The views of town and surrounding mountains from those runs are distracting. The whole experience is almost surreal it’s so good. The on-mountain lodges are impressive, but I couldn’t tell you anything about the food because we ate at an independent place in the Village the one day we actually had lunch. 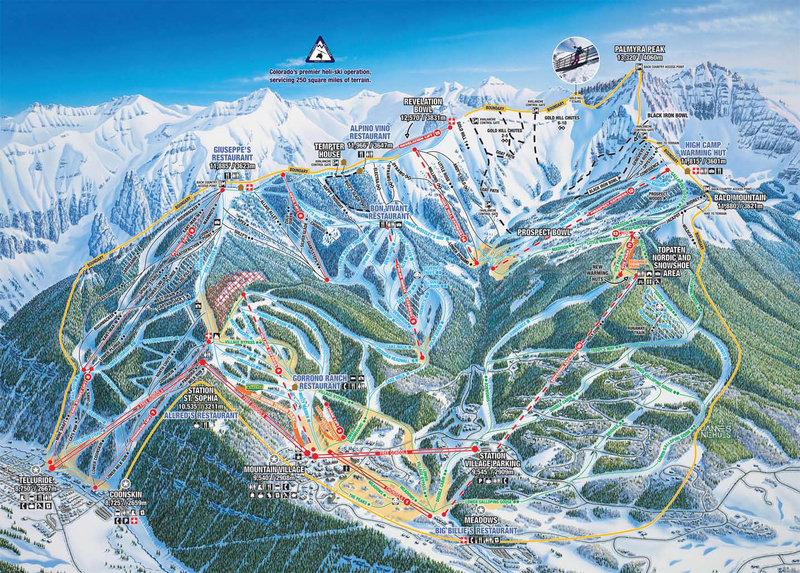 Another good option would be to just ski into Town where there are lots of options close to the gondola base. We met a local character on the Plunge lift who skis EVERY DAY of the season, and has been doing so since the 70’s. Everyone seemed to know him and the local magazine had an article about his exploits. He said he only missed a couple of days when he was in the hospital one time but other than that he has a flawless record. 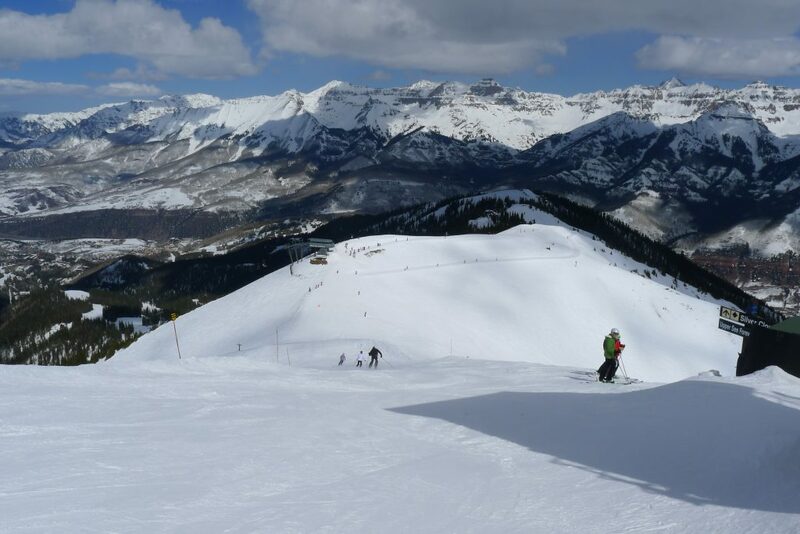 Telluride is that kind of place where it’s so amazing that you could ski there for a lifetime and still want to do it every day. That’s why it is our number one resort! Since we consider this to be the best resort on our list, of course we will go back! We had a fantasy of buying a condo in the village so we could spend more time there, but that is out of reach at the moment so for now we will have to visit when we can.